1. J. S. Bach: Siciliano (Sonata for Flute in E Flat Major) BWV 1031 2'14"
2. J. S. Bach: Air (Suite No. 3 in D Major) BWV 1068 5'00"
3. L. Schmetterer: Sonata for 4 Clarinets and Bass Clarinet Op. I. Allegro moderato 2'35"
4. 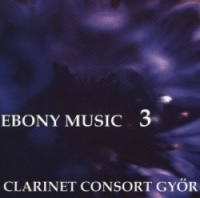 L. Schmetterer: Sonata for 4 Clarinets and Bass Clarinet Op. II. Allegro 5'19"
5. L. Schmetterer: Sonata for 4 Clarinets and Bass Clarinet Op. III. Moderato 4'54"
6. L. Schmetterer: Sonata for 4 Clarinets and Bass Clarinet Op. IV. Allegro vivace 4'19"
7. J. Brahms: Waltz Op. 39 No. 15 3'36"
8. J. Strauss: Pizzicato Polka 2'00"
9. A. Baksa: Miniatures Op. 29 16'04"
10. J. Pazeller: Memories from Hercules Bath 3'00"
11. K. Schmid: Visions I. Prelude 2'04"
12. K. Schmid: Visions II. Menuette 2'18"
13. K. Schmid: Visions III. Scherzo 1'52"
14. K. Schmid: Visions IV. Arabesque 2'03"
15. F. Lehár: The Merry Widow 6'07"